A Yorkshire entrepreneur who helped revolutionise the haircare world with the iconic GHD hair straighteners, has launched an award winning luxury British hair care range direct to consumers following its successful debut in salons last year. Jim Wardle is the co-founder and director of THERAPI, along with his wife Katie, have developed the salon professional range with a total of 10 cleansers, conditioners and styling products after spotting a gap in the market for products that protect and enhance hair, but crucially have a reasonable price point. 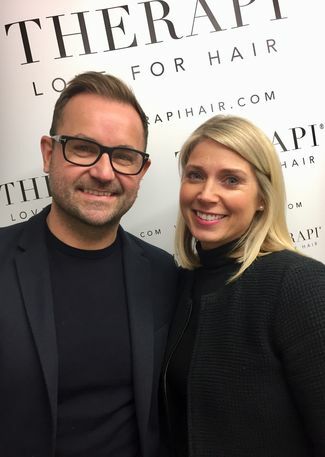 The THERAPI range is one of eight brands distributed to salons across the UK from the company’s base at Thorpe Arch in Wetherby, where it employs a team of 10. It is the first to be made readily accessible to the consumer market through the company’s newly launched THERAPI website. Having been so well received in salons across the UK, THERAPI showcased at Radio 1’s Big Weekend, where it was used to treat and style Ed Sheeran and Liam Payne. We have also supported celebrity make up artist Donna May Clitheroe at her London make up accessory launch and more recently attended a Manchester based event run by celebrity Jessica Cunningham. Jim added: “We already knew how popular the range was with salon customers, but to see the overwhelming support for THERAPI at Radio 1’s Big Weekend was an incredibly rewarding moment for us. We have put our hearts and souls into this range and as a result of that soaring consumer demand, we have now made all the much-loved, award winning products available to buy direct online by investing heavily in a new website. © Copyright 2019. THERAPI Ltd (Reg. No. 08389498, VAT GB 173 7639 75). All rights reserved.